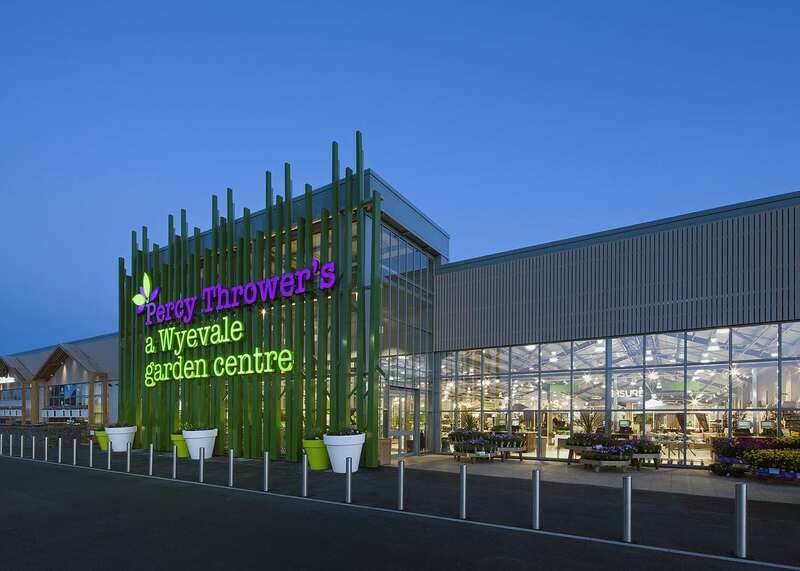 LAPD created a progressive lighting design that elevated the Percy Thrower garden centre in Shrewsbury to a retail destination. On approach to the garden centre, an enormous feature greets customers. Illuminated from below by small but powerful fittings, the 15 metre-high spade forms an unexpected and dramatic arrival statement. The façade design immediately sets this apart from other garden centres. A wall of lush foliage marks the Garden Entrance, lit with wide and medium beam LED floodlights. This combination created a bright ambient level, welcoming customers, as well as a touch of drama on the green wall. Planar glazing dominates much of the façade, therefore revealing the warmth of the in-store environment. 3000K LEDs and metal halide are in use throughout, within luminaires with excellent optical control. In combination with wooden panelling and display features, the 3000K colour temperature contributed to an appealing, inviting store environment. For this reason, this project distances itself from the utilitarian aesthetic of most garden centres. In the Main Entrance zone, 5W LED glass pendants with caps in white, chrome or green make a decorative feature. This was an important decision, creating visual interest on top of a layer of ambient light. For general lighting, we wanted to replace the staple of open metal halide high bays with reeded glass diffusers. We specified a sleek and modern alternative finished in white. Still using a 150W metal halide lamp to ensure good ambient light levels, this high bay featured an internal opal glass shade encapsulated within a clear glass casing. The glass casing prevented dust from settling on the opal shade, so the luminaire would retain its clean aesthetics and output. The store features a Guru / Greenhouse area, marked by the use of bare filament lamp pendants with cords and caps in three different colours. These appear alongside industrial-style enamelled pendants in green. As a result, the Greenhouse is an intimate space. Here, customers can sit to discuss their requirements with store staff and attend workshops. Bespoke flower pot pendants, suspended over the central walkway, round out the feature pendant specification. Driven by a 3000K 7W LED lamp, the terracotta pots glowed, consequently creating a unique and warm aesthetic that assisted customers in navigating the store. Another departure from standard garden centre lighting was the heavy use of accent lighting. Suspended three-circuit track fitted with 35W metal halide spotlights appear extensively throughout the project. It delivered a more dramatic and interesting lit environment that allowed the feature pendants to stand out. Outdoors, the use of unexpected lighting treatments continues. 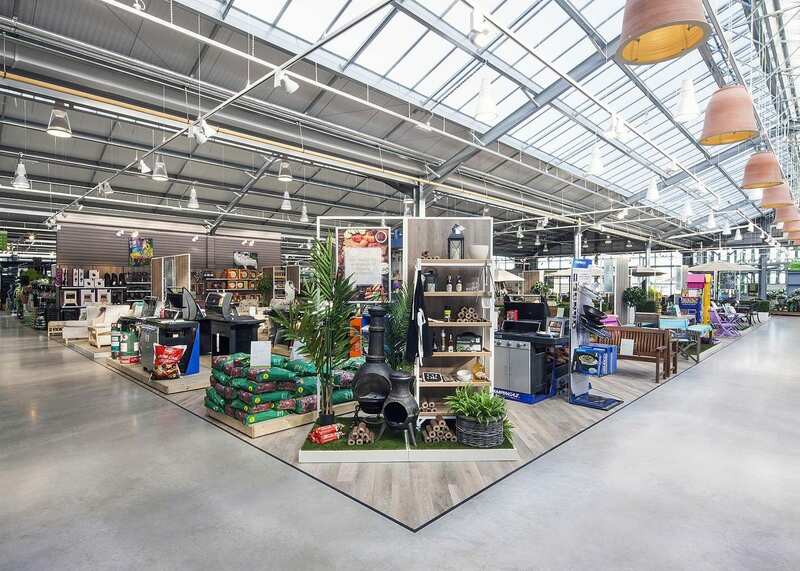 The perimeter of the outdoor space is punctuated by “wardrobes”, lit with warm LED floodlights to act as destinations among the large expanses of plants on sale. Finally, the undisputed showpiece of the project is the external feature luminaire. 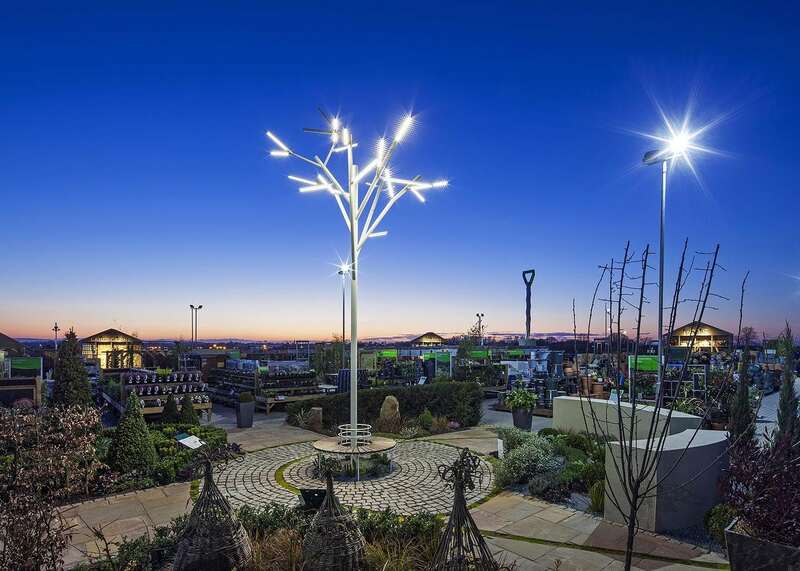 As one of the first instances of iGuzzini’s Albero being specified in the UK, the garden centre benefits from a spectacular centrepiece. It introduces a significant amount of ambient light and acts as a beacon, visible from around the outdoor space and even from the car park entrance road.